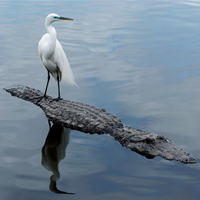 This brave egret picks an unlikely perch to stand on while looking for her lunch – the back of an alligator. Luckily for the brave egret, the big gator barely moved a muscle and let her observe the water before she flew off to a nearby tree. This rare encounter was captured by nature photographer Andrew Sentipal when he visited the Everglades in Florida.